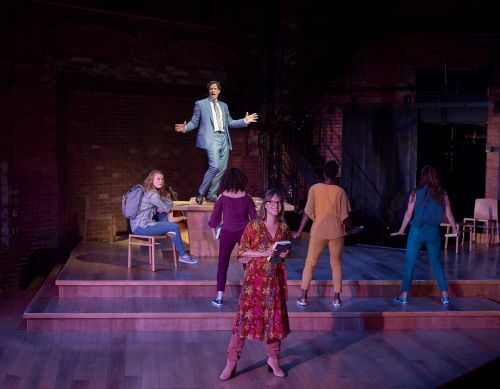 Britta Johnson’s musical, Life After, co-produced by The Musical Stage Company, Yonge Street Theatricals and Canadian Stage, opened at the Berkeley Street Theatre on Thursday. It’s a strong production with powerful music and a really contemporary feel while at the same time giving a nod to traditional musicals. My daughter Megan came with me. I love going to shows with her. I’m all about what I feel and think after a show. Meg knows why she feels and thinks it. Articulating the ‘why’ is my challenge. We both really enjoyed the show. The audience joined us in weeping, a lovely change for me, but it’s not all tears, there’s lots of laughter. Alice’s (Ellen Denny) father, Frank (Dan Chameroy), a self-help guru, died in a car accident on her sixteenth birthday. Alice is trying to understand the events that led to the accident and come to terms with his death. Johnson wrote the book, lyrics, and music for Life After. It’s impressive by any standard but when I think that she’s about 26 it amazes me. The songs are strong and the music shone under Reza Jacobs’ musical direction. Having a live – although small – orchestra added to the wonderfulness. We both liked the way that director Robert McQueen used the whole area having characters enter from both sides and through the audience, moving the action, sometimes having more than one thing happening at a time. He also allowed for moments of silence, something that’s unusual in musicals but was very effective. The chorus (Neema Bickersteth, Barbara Fulton, and Anika Johnston), we loved the chorus! The way they were used to signal a change in direction of the story and to emphasize Alice’s thoughts was so effective. And the way they moved! The way everyone moved. Linda Garneau’s choreography was fantastic. It was subtle but nuanced. Just by being there it added to the whole. We loved the way they were dressed. Skinny jeans, tops, and shoes, all matching but each performer in a different bright colour. Ming Wong’s costumes are great. Beth (Tracy Michailidis), Frank’s widow, wore a light grey skirt, tunic, and coat that matched her calm, pulled together personality for most of the show. When she finally breaks down she’s wearing sweat pants and a baggy t-shirt. Even though this is billed as a story about Alice and her journey to work through her feelings about her father’s death it’s also about how the other people in Frank’s life life deal with it. Johnson’s ability to create fully developed secondary characters is a special gift. I didn’t particularly like the Alice character. Denny’s portrayal of a 16 year-old totally caught up in herself and quite oblivious to the effect she’s having on the people around her was very effective. I wanted to shake her. Rielle Braid’s (Kate, Alice’s older sister) portrayal of a young woman trying to ease her mother and sister’s grief at the cost of expressing her own was wonderful. Her comic timing was perfect. Kelsey Verzotti was a delight as Hannah, Alice’s best friend. She embodied a 16 year-old, who, with the best intentions in the world, can’t find the right thing to say to comfort her friend. She was lovely. Trish Lindstrom ‘s anguish as for Alice, as her teacher, and her conflicted personal grief for Frank were palpable. Her display of joy in one of the flashbacks was a delight. Dan Chameroy was, as always, marvelous. His public Frank, the self-help guru, was every good speaker I’ve ever seen; sincere, relaxed, a tiny bit evangelical. As the father he was in turn loving, angry, apologetic, wise, funny, sad, and wacky. As a husband he was demanding. One of my favourite parts of the show was Chameroy singing Line 33 and dancing down a set of stairs. Very old-timey musical. Tracy Michailidis was perfection as Alice’s mother and Frank’s widow. Her restrained performance for most of the piece was full of tension. The mask of perfect widow slipped as she lamented that she used to be someone and now she was “the wife of a famous dead man”. In what was Megan and my favourite scene she finally falls apart and sings an amazing song about paint and wallpaper that expresses her grief, frustration, and anger. It was the most powerful scene in the play. And here’s our quibble. It should have been the final scene. Not that the play should have ended then, there was good stuff that came after, but that scene should have come at the end. It was poignant, cathartic, and beautiful. It involved the whole family and for both of us the strength of this piece was that it was about more than just Alice. One other quibble. The show seemed to drag a bit. Neither of us could say exactly why. And something we really loved. The cast was eight women and one man. Sort of like opposite land. Impressive performances and great music made for an enjoyable evening. Definitely worth seeing. Take tissues. I cried in the first 30 seconds, so did the woman in front of me and the man in front of her. Shows run Tuesday thru Thursday and Saturday at 8:00pm and Friday at 7:00pm with matinees Wednesday, Saturday, and Sunday at 1:00pm.